Azurite is found in Australia, Chile, France, Mexico, Morocco, Nambia, the southwestern USA, and Zaire. 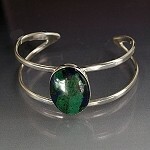 Azurite, a basic copper carbonate mineral, often occurs with Malachite or Chrysocolla. Azurite helps to reduce anger and to increase psychic awareness. It is also thought to reduce abnormal cell growth, promote wisdom, and is used as an aid to relieve the pain of rheumatism. Azurite is sensitive to heat, so do not clean in an ultrasonic. Azurite can be wiped using a soft cloth. a solution of mild dish soap (not lemon scented) and warm, not hot, water. Remove your azurite jewelry when cleaning, exercising or playing sports. Store azurite stones, as well as any gemstone jewelry, separate in bags or soft cloth. Do not place azurite under direct sun for long periods of time.